Over the last week Seattle has slowly started to feel more like fall. Now that Labor Day weekend is over, I'm not complaining. Bring on the crisp air and cozy layers! Fall fashion is officially making a subtle appearance into my everyday outfits while I'm still trying to embrace the last few weeks of summer we have left. This mixing and matching of seasonal styles can be a challenge but really, it all comes down to pairing the right items of clothing together. In this second look of my back to fall inspired series, I'm showing off yet another way to wear one of my favorite fall items: leather. 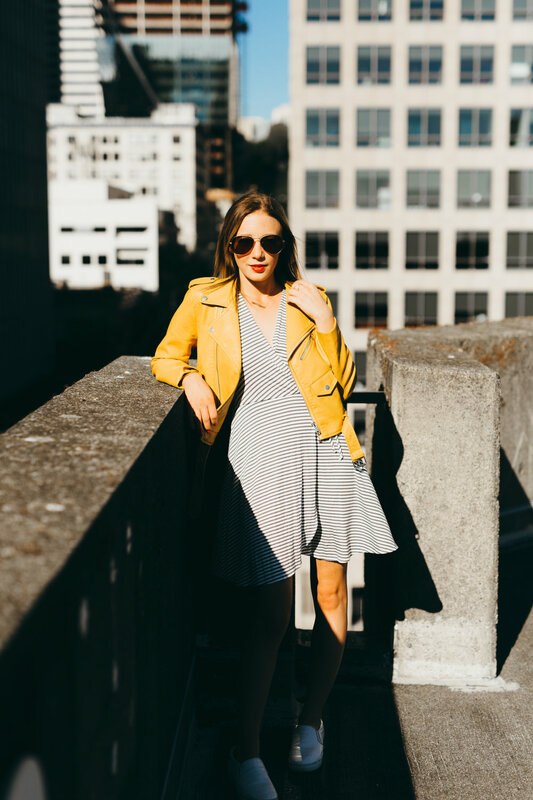 Leather can be a challenge to wear on days that still feel like summer, but the beauty of layering it with summer pieces is you can get away with this fall fashion staple. My Zara yellow leather jacket is my favorite item in my closet this season. I love the bold color and statement it makes with the detailing on the front from the flaps, metallic zippers and the buckle around the waist, this jacket is a must-have for your wardrobe. To keep things cool underneath, I'm wearing my Verity striped wrap short sleeve dress. I love how a dress this simple can look so flattering with the front tie detailing and the statement v-neck. It contrasts my jacket nicely with the striped pattern to add some additional interest to my look while not competing with the bold color of my jacket. This dress is extremely versatile -- whether you want to throw on a pair of boots or heels for date night or keep things casual with sandals or a pair of athleisure-inspired kicks, like I'm rocking in this look. My faux snake skin white VANS-lookalikes are courtesy of H&M and will be getting plenty of wear this fall. They are so comfortable (we're talking slippers) and a great neutral and help make an outfit more visually laid back. When it comes to accessorizing my bold yet casual look, it's all about keeping jewelry more subdued. My Seoul Little 'West Coast' dainty gold necklace is my favorite necklace to date. It's a subtle yet personal ode to my blog, West Coast Aesthetic and the place I am lucky enough to call home (the west coast). I'm also wearing my go-to criss-cross gold ring from Brass Plum to keep the jewelry more minimalistic. Because we're in Seattle and we'll soak in as much sun as we can get, I'm wearing my Urban Outfitters aviators -- they provide great protection and I love how this style frames my face. Not to mention, the gold detailing really helps tie in my accessories. Fall fashion is all about integration. There is no need to overthink the items in your wardrobe when preparing for fall during the summer. Keep your focus on showing off one key fall piece in your outfit and also keep in mind that layers are your friend -- especially on days that start off warm and end with a bit of a chill in the air.